Over the past year or so I’ve been saving and bookmarking recipes that involve grilling, despite the fact that we lived in an apartment and didn’t own a grill. I saved those recipes with the hope that one day, we would own a grill. One day, I wouldn’t have to touch the oven during the Arizona summer and could instead make my meals outside. I’m happy to report that my hopes became reality when my boyfriend received a grill for his birthday from his parents. Yay! We’ve been experimenting every other day with the grill and have enjoyed (mostly) tasty food (there was an undercooked chicken breast and a burned loaf of garlic bread). One of my favorites so far is this recipe for shrimp and sausage skewers, a gem I saved nearly a year ago from Bon Appetit magazine. 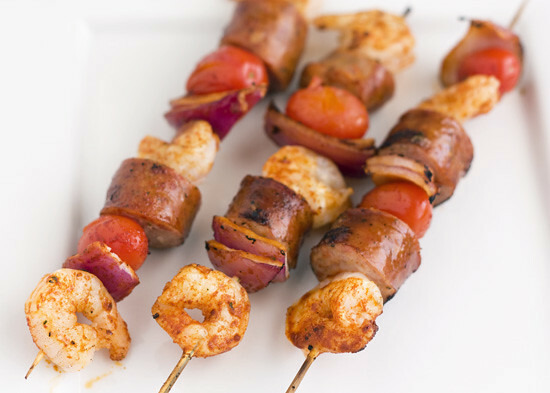 To me, this recipe sums up the essence of grilling – skewers loaded with sausage, seafood, and fresh veggies which is then glazed with an layer of smoky flavor. It doesn’t get better than that. Taste: Sweet, spicy, smoky, fresh. Texture: Lovely combination of tender shrimp, toothsome sausage, and juicy tomatoes. Ease: The most time consuming part was actually threading the ingredients through the skewers, which can be done ahead of time. If you’re like me and don’t pay attention while you’re making the skewers, you might not end up with matching skewers. Whoops. Appearance: These skewers are just begging to be eaten. Pros: Perfect recipe for a BBQ. Whisk oil, garlic, thyme, smoked paprika, vinegar, salt, black pepper, and crushed red pepper in medium bowl to blend for glaze. Transfer half of glaze to small bowl and reserve for serving. Alternately thread shrimp, sausage pieces, cherry tomatoes, and sections of onion wedges on each of 6 long metal skewers. Alternatively, use wooden skewers that have been soaked for an hour. Arrange skewers on large rimmed baking sheet. Can be made up to 6 hours ahead. Cover and chill skewers and bowls of glaze separately. Coat grill rack with nonstick spray and heat barbecue to medium-high heat. Brush skewers on both sides with glaze from 1 bowl. Grill until shrimp are opaque in center, turning and brushing occasionally with more glaze, 5 to 7 minutes. YUM!!!! I am always looking for new grilling recipes and this looks like a winner!